Movie Ramble: Snow White and the Huntsman. 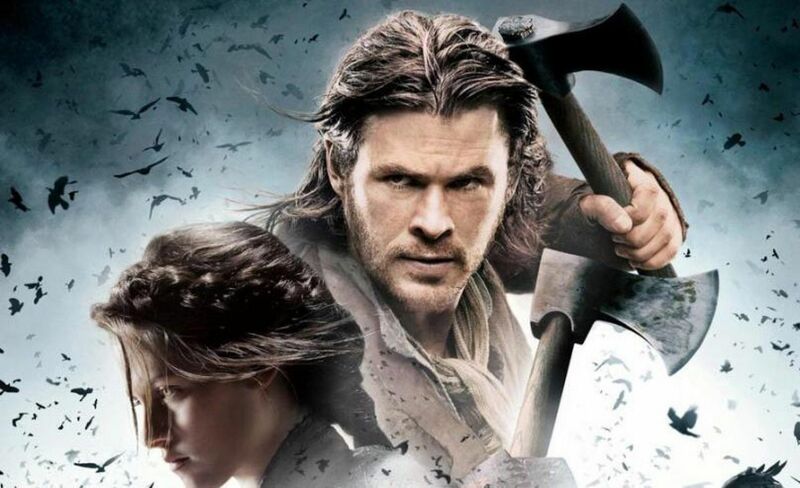 Snow White with the Huntsman. Based loosely on the German fairy tale Snow White, collected by the Brothers Grimm in 1812, British director Rupert Stevens debut film version of the famous story Snow White and the Huntsman (2012) differs slightly from the one we all read as a child. 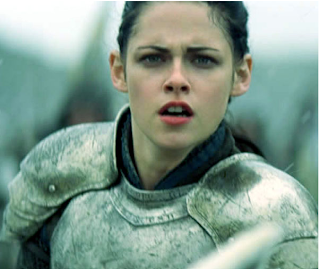 Snow White in her Joan of Arc guise. The young Snow Whites mother dies. Her father, the King Magnus, falls for the beautiful Ravenna and consequently marries her but the poor man gets more than he bargained for when she murders him while consummating their marriage. Now Queen of all the kingdom she imprisons Snow White in the traditional high tower, scares away all the decent folk that lived in the castle including the Duke Hammond and his son, Snows playmate Prince William. Ravenna’s equally wicked brother Finn, with whom she asserts a reign of terror, soon joins her. The only person that can neutralise the evil Queen’s power is imprisoned in the tall tower. The story develops to include a very unnerving Dark Forest; two love interests, a cracking grand finale when Snow White dressed in armour (we are reminded of Joan of Arc) leads her army along the Marloes Sands beach against Ravenna and her brother who are shacked up in the brilliant computer generated castle on Gateholm Island. And dare we forget the eight, yes eight, Dwarves who are played by a whole horde of very well known British actors, who have had their faces digitally transmuted onto small bodies, which apparently upset the Little People of America organisation, but they manage to add a sense of amusement to the proceedings. The castle on Gateholm Island. Although it was backed by American finance the movie was mostly photographed in the United Kingdom and boasts some great special effects. It also has some very interesting casting including Kristen Stewart as our heroine Snow White which meant that even my local cinema, that’s better known for art house productions than blockbusters and rom-coms, did entice an audience of young pubescent girls obviously attracted to the actress in her Bella Swan guise than perhaps her portrayal of Joan Jett in The Runaways (2010). 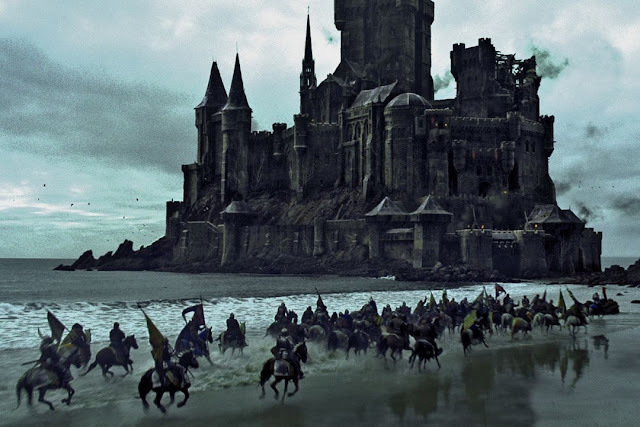 The cast also included Sam Claflin, who was last seen on the big screen in the latest Pirates film On Stranger Tides (2011) as Prince William, Charlize Theron as Queen Ravenna and Chris ‘Thor’ Hemsworth as the Huntsman of the title. I thoroughly enjoyed this very watchable, well-made movie it certainly kept me entertained for its fast-moving 127 minute running time and I for one will be looking forward to its planned sequel. Six of the eight dwarves.